Doctors ask: Why such poor coverage of single-payer? Two Harvard doctors, noted ‘Medicare for all’ advocates, say the press, along with politicians, is part of a black-out. They offer some questions that should be asked. On May 5, eight protesters, including three physicians, were arrested during a public roundtable led by Senator Max Baucus (D-Montana), chairman of the Senate Finance Committee and a leader of the health reform effort in the Senate. Their crime? 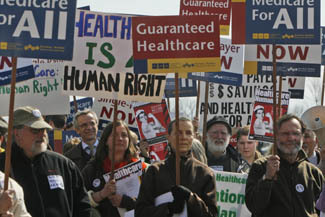 Protesting that none of the fifteen invited witnesses were supporters of non-profit national health insurance, also known as “single-payer” or “Medicare-for-All”. The black-out on discussion of single payer reform is not limited to politicians. All too often, reporters fail to describe the single-payer alternative, explore its economic feasibility, or interview its proponents. This, despite polls showing majority or near majority support among U.S. voters and U.S. physicians. Single-payer reform bills have been introduced in the U.S. Senate, and in the House of Representatives, where about 80 members have become co-sponsors. On May 12th there were five new arrests at a Senate hearing. That resulted in a National Public Radio story and a little more press coverage overall, but not much. Here are some questions reporters might consider asking politicians proposing mixed public-private models, individual mandates, market-based reforms, and other health reform measures short of single payer. Q. Single payer reform would cover every resident of the U.S. How many of the 46 million uninsured Americans would your plan cover? Q. An article in New England Journal of Medicine estimated the administrative costs of U.S. health care at 31% of health spending, double those of Canada’s single payer system. How much would your plan save on health administration? How would it save that money? Q. A recent study appearing in the JAMA found that chronic disease management programs in Medicare saved no money. How would the chronic disease management programs you advocate differ from the unsuccessful ones to date? Q. The CBO has stated that there is no evidence that medical computerization has saved money. How would the medical computerization you propose be more cost-saving than that of the past? Q. Prevention saves lives, but (according to a recent study in the New England Journal of Medicine) usually raises costs. What is the magnitude of the savings you project in your plan from prevention, and how will you achieve them? Q. A 2005 study found that half of all personal bankruptcies are due, at least in part, to medical illness or medical bills. It also found that 76% of those bankrupted by illness had health insurance at the onset of the illness that bankrupted them. Some debtors lost their job-based coverage when they got too ill to work; other kept their insurance throughout the illness, but were bankrupted anyway by gaps in coverage like co-payments, deductibles, and uncovered services. How would your plan deal with this problem, sometimes called “under-insurance”? Woolhandler and Himmelstein are active in Physicians for a National Health Care Program. Click here for the group's Web site. For those interested in a Canadian perspective on the US Health Care debate, there is an very good article by Neil Macdonald on the CBC Web Site. Neil has been a CBC correspondent for many years, and has been based in Washington for 5 or 6 years now.